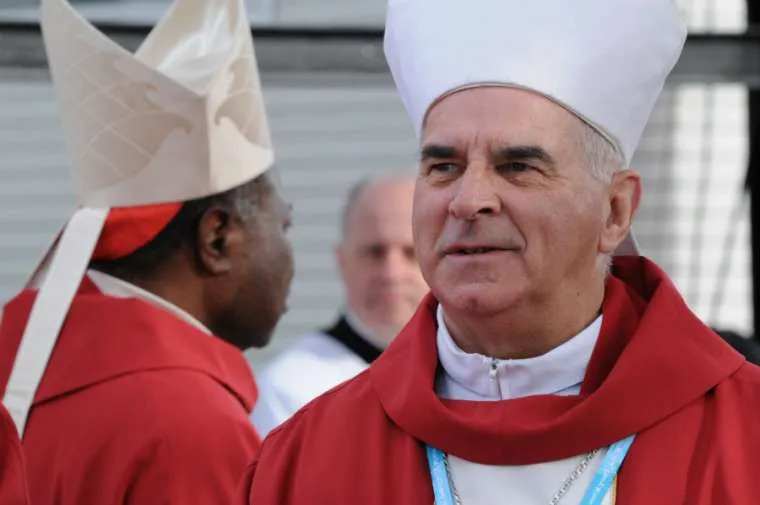 Vatican City, Mar 19, 2018 / 07:49 am (CNA/EWTN News).- Ex-cardinal Keith Patrick O’Brien, who stepped down as Archbishop of Edinburgh in 2013 after admitting to inappropriate sexual conduct throughout his ministry, died Monday at the age of 80. In a brief statement marking the prelate’s March 19 passing, the current head of the St. Andrews & Edinburgh diocese, Archbishop Leo William Cushley, offered prayer for the repose of O’Brien’s soul, for his family and for all those affected by the scandal. Born in Ballycastle, County Antrim, Northern Ireland in 1938, O’Brien was named Archbishop of St. Andrews & Edinburgh by St. John Paul II in 1985. Ordained a priest in 1965, he had a bachelors degree in chemistry and mathematics, and served as a spiritual director of St Andrew’s College in Drygrange and rector of St Mary’s College in Blairs before being named archbishop. After the claims surfaced that February, the cardinal’s request for retirement – originally submitted to Benedict XVI in November 2012 for reasons due to age and health – was accepted immediately by Benedict, going into effect Feb. 25, 2013. O’Brien subsequently admitted that “there have been times that my sexual conduct has fallen below the standards expected of me as a priest, archbishop and cardinal,” and did not participate in the March 2013 conclave that elected Pope Francis. In May 2013, after speaking with the newly-elected Pope, O’Brien left Scotland for a time of prayer, penance and reflection. In March 2015, Francis in a rare move accepted his resignation of the rights and privileges of cardinal. Only a Pope can approve a cardinal resigning his official status, and today’s announcement is extremely rare in Church history. In wake of O’Brien’s resignation, Pope Francis in July 2013 named Archbishop Cushley as the next leader of the Saint Andrews and Edinburgh Archdiocese. According to a March 19 press release from the Archdiocese of St. Andrews & Edinburgh, the former prelate died at the Royal Victoria Hospital in Newcastle-upon-Tyne after receiving last rights, and was surrounded by his family and friends. Who was Albino Luciani, the ‘smiling Pope’? Vatican City, Nov 17, 2017 / 03:01 am (CNA/EWTN News).- Last week Albino Luciani, better known by his papal name, John Paul I, took the next step on the path to sainthood. Yet apart from the fame garnered by various theories that sprouted due to the enigmatic nature of his death, for many little is known of his saintly life and brief pontificate. Born Oct. 17, 1912, in Italy’s northern Veneto region, Albino Luciani, known also as “the smiling Pope,” was elected Bishop of Rome Aug. 26, 1978. He made history when he became the first Pope to take a double name, after his two immediate predecessors, St. John XXIII and Bl. Paul VI. He sent shock waves around the world when he died unexpectedly just 33 days later, making his one of the shortest pontificates in the history of the Church. In addition to the novelty of his name and the surprise of his death, Luciani was also the first Pope born in the 20th century, and is also the most recent Italian-born Bishop of Rome. Yet behind all the novelty of the month before his death and mystery of those that ensued, John Paul I has been hailed as a man of heroic humility and extraordinary simplicity, with a firm commitment to carrying forward the reforms of the Second Vatican Council and a knack for explaining complicated Church concepts in a way everyone can understand. Coming from a northern region in Italy that borders Austria, Luciani grew up with people from all cultures and backgrounds passing through. The area saw high levels of immigration and strong activity on the part of Catholic movements. The priests around whom Luciani grew up had a keen social awareness and involvement with the faithful. While all the basic needs of his family were met, Luciani grew up in relative poverty, with his father gone most of the time for work. However, according to Stefania Falasca, vice-postulator of his cause for canonization, this background gave the future Pope “a huge cultural suitcase” that he was able to bring with him in his various endevours. Ordained a priest of the Diocese of Belluno e Feltre July 7, 1935, at the age of 22, Luciani was rector of the diocese’s seminary for 10 years. He taught various courses throughout his tenure, including dogmatic and moral theology, canon law, and sacred art. In 1941 he received a dispensation from Ven. Pius XII to continue teaching while pursuing his doctorate in Sacred Theology from the Pontifical Gregorian University. He was named Bishop of Vittorio Veneto by St. John XXIII in 1958. In 1969 he was named Patriarch of Venice by Bl. Paul VI. He was elevated to the cardinalate in 1973, and was elected Bishop of Rome five years later. Literature also played a key role in Luciani’s formation. According to Falasca, he had a library full of books in different languages and a special fondness for Anglo-American literature. Though he knew English, French, German and Russian, his favorite authors were from the Anglo world, and included authors such as G.K. Chesterton, Willa Cather, and Mark Twain. As cardinal, he wrote his own book called “Illustrissimi,” which is a series of letters penned to a variety of historical and fictional persons, including Jesus, King David, Figaro the Barber, Austrian Empress Maria Theresa Habsburg, Pinocchio, Mark Twain, Charles Dickens, and Christopher Marlowe. Luciani, Falasca said, was considered by Paul VI to be “one of the most advanced theologians” of the time, and was held in high esteem because he not just knew theology, but also knew how to explain it. Luciani, she said, had “an ease of language” in his writing, which was coupled with “a solid theological preparation,” making him both credible and accessible. “He explained it, he put it into practice, he put the directives into action in a crystalline way.” It was this desire to carry the Council forward that formed the basis for his priorities during his 33 days in office. “This, you can say, was the meaning of the Council for Luciani.” And for him, going to the sources also meant “communicating the Gospel in simplicity and conforming his ministry” to it. In addition to mission, John Paul I also placed a special emphasis on spiritual poverty in the Church and the search for peace and ecumenism. Collegiality also was another key topic for Luciani, and it was the subject of his only written intervention during the Council, which he contributed in 1963. Luciani also placed a strong emphasis on mercy, Falasca said, explaining that in many ways he was “was the Pope of mercy ‘par excellence,’” and was known for his warm and friendly demeanor. 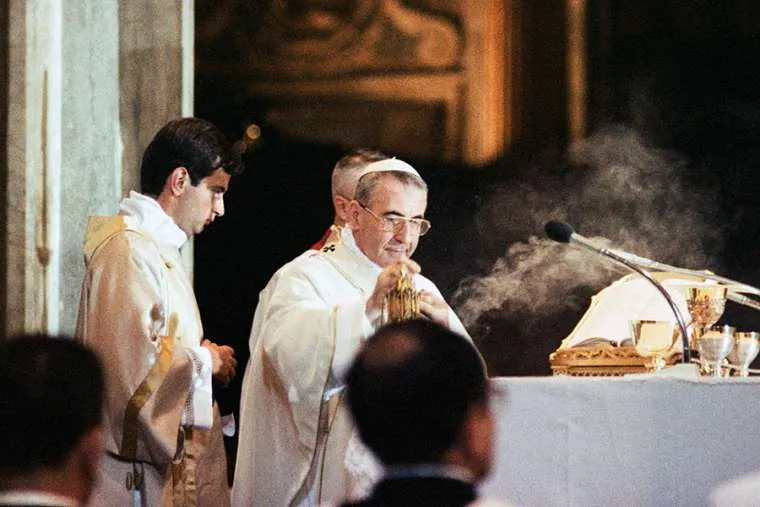 These priorities can be clearly seen in the four general audiences John Paul I gave during his pontificate, with the subjects being poverty, faith, hope, and charity. And the way he spoke about these and other topics, with “the simplicity of his approach (and) of his language,” left “an indelible memory in the People of God,” Falasca said. John Paul I, she said, moved people with his naturalness and his ordinary way of speaking to the faithful. Luciani had put this quality into writing long before his pontificate when in 1949, he published his first book, titled “Catechesis in Crumbs,” which focused on how to teach the essential truths of the faith in a simple and direct way, understandable to everyone. When John Paul I died 33 days after his election, his sudden and unexpected death led to various conspiracy theories that Luciani had been murdered. However, in a book titled “John Paul I: The Chronicle of a Death” and published Nov. 7 to coincide with the announcement that Luciani’s sainthood cause was moving forward, Falasca dispels the theories by outlining the evidence gathered on John Paul I’s death while researching for his cause. In the book, she recounts how the evening before his death Luciani suffered a severe pain in his chest for about five minutes, a symptom of a heart problem, which occurred while he was praying Vespers with his Irish secretary, Msgr. John Magee, before dinner. The Pope rejected the suggestion to call for a doctor when the pain subsided, and his doctor, Renato Buzzonetti, was only informed of the episode after his death. Luciani’s connection with the Lord was also evident in the way that he spoke about God, she said, explaining that he was able to make the love of God close to people, and felt by them. Falasca said she believes he is an ideal model of the priesthood. To this end, she recalled how during her time working on Luciani’s cause, many young priests came to her saying they felt the call of their vocation when they saw his election on TV. Another sign of his sanctity was the “spontaneous reputation” that grew over time, and is a “distinctive sign” in determining the heroic virtue of a person. Benedict XVI’s testimony regarding John Paul I is four pages long and is one of the documents included in Falasca’s book. In her comments to CNA, she said they had originally planned to interview him in 2005 while he was still a cardinal, but he was elected Pope on the same day he was scheduled to speak, and since a Pope is technically the one judging a saints’ cause, he is not allowed to give testimony for it. However, there are currently no previsions for a retired Pope, so when Benedict XVI resigned in 2013, Falasca and her team advancing Luciani’s cause reached out again, receiving the testimony that has now been published in her book. In his testimony, Benedict recalled that he first met Luciani while the latter was Patriarch of Venice. He had decided to visit the seminary in Bressanone with his brother, Msgr. Georg Ratzinger, for vacation in August 1977, shortly after becoming a bishop. Speaking of John Paul I’s pontificate, Benedict noted that in 1978 it was evident that “the post-conciliar Church was passing through a great crisis, and the good figure of John Paul I, who was a courageous man on the basis of faith, represented a sign of hope.” And this figure, he said, still represents “a message” for the Church today. So far hundreds of graces and favors have been recorded for those who pray to Luciani, and there are already two miracles being studied and considered for his beatification and eventual canonization. Falasca said they are currently trying to decide which to present first. 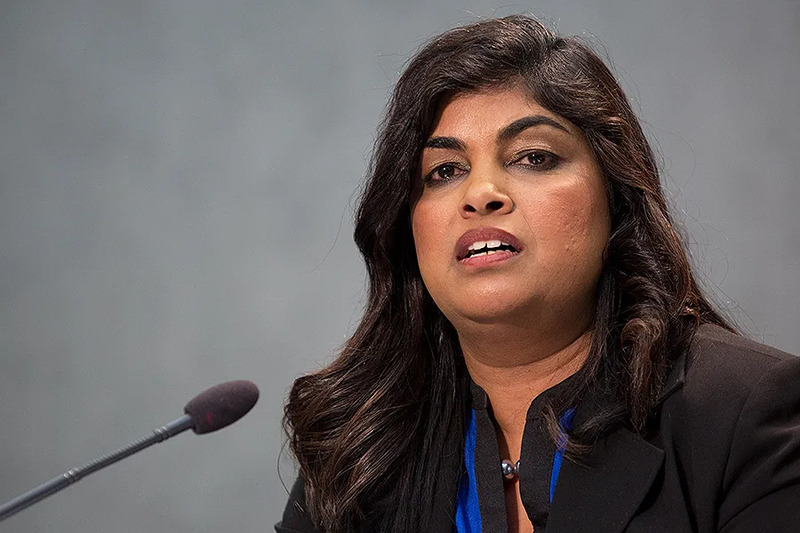 Vatican City, Nov 9, 2017 / 02:54 pm (CNA/EWTN News).- Former trafficking victim Rani Hong, who was kidnapped and sold into slavery at seven years old, is speaking out, saying we’ve raised awareness, but now it’s time to put our knowledge into action to help victims. Hong’s story begins in India when she was a young child. A well-respected woman in the community approached her mother offering to clothe, feed, shelter, and educate her daughter during a difficult time. So she went down the street to live with the woman, her mother and family visiting every day. But one day, Hong said, she was gone. The woman was in fact recruiting children in the streets of India and had sold her across the border into another state. “We’re talking about a human being, myself, being captive. This is what the industry of human trafficking does,” she told journalists. By the time she was eight years old she had become sick and near death from the beatings and starvation she had endured to get her to submit to her trafficker. Since she was no longer considered valuable for forced labor and her trafficker wanted “one more profit,” Hong was sold into illegal international adoption. “We’re talking about buying and selling people,” she emphasized. From there she was adopted by a woman in the United States and this is where she was able to start to heal and slowly start building her life again, she said. Amazingly, through what she terms “a miracle of God,” she was also able to find her birth mother and family in India in 1999. It was finding her birth family, she noted, that inspired her to do something to help, with her faith in God giving her the strength to heal and to be able to share her story. “My faith helped me to get stronger. And every day it’s a challenge. Every day I have to make a choice to do something and to have faith” that we can make a change, she said. Now she and her husband, also a survivor of child slavery, have a non-profit organization called the Tronie Foundation, which works with business partners to help ensure supply chains do not use slavery and forced labor. One practical initiative they’ve developed is the “Freedom Seal,” which helps consumers identify products from manufacturers independently audited to ensure fair labor practices. Hong also speaks to lawmakers about creating and implementing laws to protect victims, help survivors, and prosecute traffickers. In 2011 she was appointed UN special advisor to the global initiative to fight human trafficking. She was also invited to the Vatican to participate in a Nov. 5-6 workshop centered on helping former victims and run by the Pontifical Academy of Social Sciences. She said being at the Vatican was a “huge step forward,” and hopefully inspired the academy and others to take on the issue with even more force. Material from EWTN News Nightly and Vaticano was used in this article. Clericalism to the end and not a word to show remorse on the part of Keith Patrick O’Brien. “May have divided opinion” Cushley said. “Did nothing wrong in my opinion” would be a more accurate statement from Cushley.